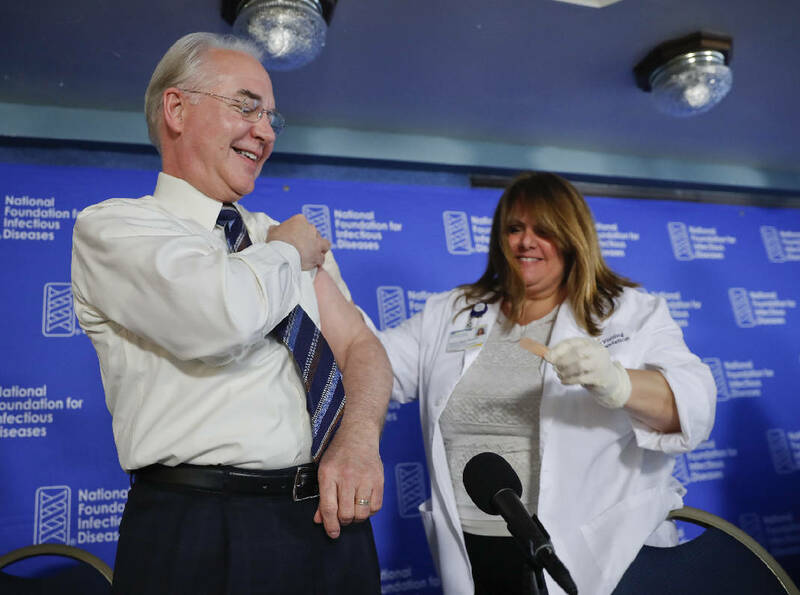 WASHINGTON (AP) — Fighting to keep his job, health secretary Tom Price says he'll write a personal check to reimburse taxpayers for his travel on charter flights taken on government business and pledged to fly commercial — "no exceptions." The repayment — $51,887.31, according to Price's office — covered only the secretary's seat. Price did not address the overall cost of the flights, which could amount to several hundred thousand dollars and is under investigation. "I regret the concerns this has raised regarding the use of taxpayer dollars," Price said in a statement. "I was not sensitive enough to my concern for the taxpayer." His mea culpa came a day after a public rebuke from President Donald Trump. A former congressman from Georgia regarded as a conservative policy expert, Price said he hopes to keep his Cabinet seat. At the White House, press secretary Sarah Huckabee Sanders wouldn't go that far. "We're going to conduct a full review and we'll see what happens," Sanders told reporters. Travel by other top officials is also attracting scrutiny. Price said the president had personally let him know of his displeasure. "As he has said publicly, he wasn't happy, and he expressed that to me very clearly," Price said Thursday evening on Fox News. All his travel was legally approved by officials at Health and Human Services, Price said. It amounted to 10 trips with 26 different segments. On Wednesday Trump had declared that he's "not happy" over reports that Price flew on costly charters when he could have taken cheaper commercial flights. Asked whether he'd fire Price, Trump said, "We'll see." Price told reporters Thursday, "I think we've still got the confidence of the president." About the controversy, he said, "We're going to work through this." Taxpayers "won't pay a dime for my seat on those planes," Price said in his statement. Price played a supporting role in the fruitless Republican effort to repeal Barack Obama's health care law — another source of frustration for the president. Prompted partly by controversy over Price, the House Oversight and Government Reform Committee has launched a wide-ranging investigation into travel by Trump's political appointees. On Wednesday the committee sent requests for detailed travel records to the White House and 24 departments and agencies, dating back to the president's first day in office. Trips by Treasury Secretary Steven Mnuchin and EPA Administrator Scott Pruitt have also drawn criticism. A senior GOP lawmaker urged Trump to lay down some rules. "Considering the many travel options to and from Washington, D.C., I'm urging you to emphasize to Cabinet secretaries the necessity of using reasonable and cost-effective modes of travel in accordance with federal restrictions," Sen. Chuck Grassley, R-Iowa, wrote to Trump on Thursday. The president had vented about Price to reporters on Wednesday as he left the White House for a trip to sell his tax overhaul in Indianapolis. Price's travels were first reported last week by Politico, which said cheaper commercial flights were a viable option in many cases. Last Friday the HHS inspector general's office announced it was conducting a review to see if Price complied with federal travel regulations, which generally require officials to minimize costs. Price's office had initially said the secretary's demanding schedule sometimes did not permit the use of commercial airline flights. Price says he's fully cooperating with investigators. Trump's publicly expressed displeasure — or ambivalence — has been a sign in the past that the tenure of a key aide will soon be over. In August, the president was asked if he still had confidence in Steve Bannon, then a senior strategist in the White House. "He's a good person. He actually gets very unfair press in that regard. But we'll see what happens with Mr. Bannon," Trump said. Bannon was out three days later. Price, an ally of House Speaker Paul Ryan, is a past chairman of the House Budget Committee, where he was a frequent critic of wasteful spending. As HHS secretary, he has questioned whether the Medicaid health insurance program for low-income people delivers results that are worth the billions of dollars taxpayers spend for the coverage. He's a former orthopedic surgeon who once practiced in an inner-city hospital.